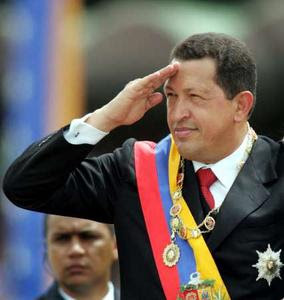 Hugo Chavez was elected president of Venezuela in 1998 and took office 2 February 1999. Chavez was a career military man who formed a revolutionary force within the Venezuelan army and led a failed attempt to overthrow President Carlos Andres Perez in 1992. After two years in prison, Chavez was pardoned by President Rafael Caldera and made the transition from soldier to politician. An engaging speaker and charismatic personality, he was elected to the presidency as a leftist reformer and modern-day Simón Bolívar. (His reforms are called the "Bolivarian Revolution.") Since taking office he has instituted sweeping reforms that have resulted in widely divided opinions of his presidency, but supporters see him as a populist leader and champion of the poor . He has shunned U.S. and European support and focused on South American and Third World solidarity. He is an economic and political supporter of Fidel Castro and a sharp-tongued critic of George W. Bush. His presidency has provided some topsy-turvy times for Venezuela: Chavez survived a kidnapping and coup attempt in April of 2002 and withstood a recall referendum in August of 2004, and news accounts from Venezuela often report both pro-Chavez and anti-Chavez rallies. A parliamentary election in late 2005, boycotted by some opponents, gave Chavez supporters control of the National Assembly, and on 3 December 2006 he was easily re-elected to another six-year term.